I live close to the High Street and can typically walk its length and back in about 15 minutes, on a sunny Wednesday a few weeks ago it took me about an hour. I didn’t stop at the shops or get a coffee. No, I was blindfolded by a nice gentleman called David, accompanied by my new pal Hazel. They weren’t leading me to an execution or a surprise although both transpired in a sense later on. David is a volunteer Guide for the Guide Dogs charity and Hazel volunteers for RNIB, Guide Dogs and a several other enterprises supporting the visually impaired and blind. 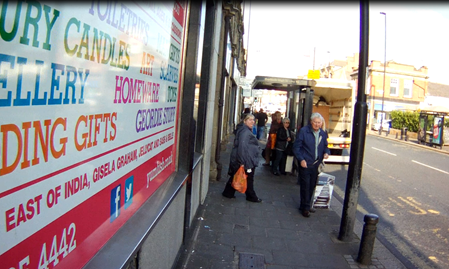 Hazel has lived near the High Street most of her life and knows every inch of it, literally, for she has been blind from birth and knows every lump, bump, gaps between buildings, every door way and every shop. Hazel is often on the High Street. I met Hazel a few months ago, we got chatting about getting around, walking, cycling and buses. It was pretty clear that we had exactly the demands for our streets and pavements, they just run in parallel. Hazel’s from a blind pedestrian’s perspective and mine from a bloke who sometimes gets about on a bike. We both want safe separated infrastructure. Not just for us, but for everyone from 8 to 80, of all abilities. Don’t worry if you’re 7 or 79 it’s just two ages that are pretty wide ranging and sound good together! Hazel thought it would be good for me to experience the challenges that visually impaired people experience every day, and recommended I undertook a blindfold walk along our High Street with her and David to keep me safe. So, on that sunny Wednesday a few weeks ago here I am with the challenge of getting up to The County, cross over, down to the Salters car park, cross over and back to Costa, blindfolded. Well actually at the beginning David put some glasses on me which he could adjust to allow me to experience both tunnel vision and complete loss of sight. I’ve got a video camera stuck on my forehead too to record what I won’t be able to see. My new view of the world! David explains the importance of finding my ‘inner line’ – that’s what feels like a safe place away from the road, close to the buildings and the position I need to always find and follow. Some quick instructions on sweeping the long cane in front of me and we are off. Well actually ‘off’ probably gives the wrong impression. What happens is a 55 year old guy edges tentatively forward like a 10 month old baby learning to walk. Hazel and David are off! I can vaguely see them through the pin holes, but I have no peripheral vision so I can barely work out whether I am moving in a straight line. It’s completely disorientating and really frightening. You have a tiny amount of vision in front of you but see nothing around you, people pass by and just appear in front of you. David and Hazel are waiting, so I try my best at shuffling forward, concentrating on sweeping my cane. The very first thing you realise is how bumpy our pavements are. An inch of raised slab is enough to jar the cane which is really annoying when you’re concentrating on not walking into the road or a bollard at the side of the pavement. A bollard designed to perfectly bang your shin and topple you over in front of the oncoming X11. Edging along I eventually get to the crossing at Lloyds and David explains the use of the tactile paving at the crossing. If you’ve ever wondered how tactile paving works, it’s pretty simple. At a crossing you’ll often see a patchwork of ‘blisters’ running from the back wall (where possible) to the crossing point. You’ll feel the blisters underfoot and they guide you to the crossing point. The use of tactile paving is currently being reviewed nationally by the government to create a new set of standards. You might have seen vertical lines at various places around Newcastle, these are used to warn the visually impaired that they are about to walk into a different area, perhaps a cycle lane or the end of a pedestrian only area. Anyway, it’s a relief to know I’m standing somewhere that feels safe. Then comes my first crossing at Lloyds Bank. David grabs my elbow and we wait for the signal to cross. Pedestrian crossings are confusing, some make bleeping noises some don’t. There’s a twiddly thing under the crossing button box that rotates when the green man comes on, but I am fumbling around trying to find it as there’s no bleeping sound at this crossing. Waiting just at the crossing is scary, a white van suddenly appears in front of me really close, not the driver’s fault just the little amount of space there is. The lights change and David grabs my arm and marches me across to sanctuary. Without David and Hazel I would have been marooned, this was a situation I found myself in repeatedly on my journey. Edging along I bang my shoulder on my first lamppost. It’s perfectly placed on my ‘inner line’. Just before Thorpe’s David changes the setting on the glasses to lose all vision. The tunnel vision was scary, now it’s absolutely terrifying. I thought I was moving slowly before, but now a snail could overtake me. 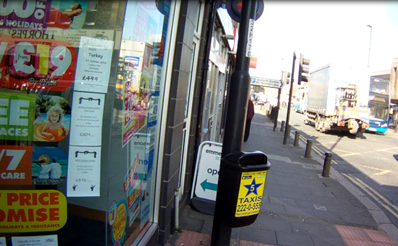 I edge along past the shops, my cane hitting the shop display and it gets stuck under something. After a bit of concerted waggling it’s free and I’m on the move. Near the bus stop everything narrows, my cane hits objects both on the l eft and right. Hazel explains to me it’s ‘A boards’ and that over the years the number of A boards has increased dramatically. I take the A boards for granted and have never really considered the impact. Hazel explains that she understands the need for shops to advertise themselves but wished that they took a little time to consider the impact they can have on the visually impaired. A boards are frustrating since they immediately slow you down, but they also are generally pretty heavy and hurt when you walk into one. David guides me around the obstacles, I’m already feeling exhausted and I haven’t got to the half-way point yet. Then I walk into some shubbery that’s overhanging onto the footpath. It’s not a major problem as I’m moving so slowly, but for Hazel who confidently moves a lot quicker it can really hurt, a faceful of sticks when you least expect it. I’m about to cross over to the County but… there’s no tactile paving and it’s a dropped kerb. Without David I would have just walked out into the road. David takes my elbow and we cross over to the County round the corner to the Pelican, relief, tactile paving and the Pelican makes a bleeping noise. Over the road and edging along and everything narrows again, another lamppost. I guess you can just about squeeze a double buggy through the gap. Onwards to Hawthorn Road and another dropped kerb with with no tactile paving. Hazel of course knows the area well and can feel the change in the pavement with her cane. Over the road and I walk into one of those bollards! Negotiating the car on the pavement and various bits of street furniture slows me down even more. The journey down the High Street is going slowly, keeping to my ‘inner line’ and then I walk into a carefully positioned bin on a lamppost. 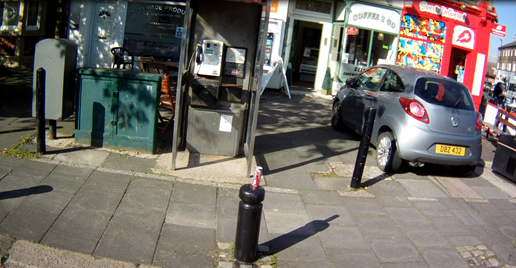 It’s another lamppost on my inner line, with the added obstacle of a bin. David displays the greatest patience with me as I head towards West Avenue and Trinity Church. 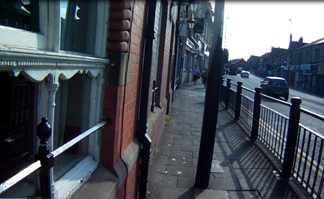 West Avenue – dropped kerb, no tactile paving. I now have the greatest of respect for everyone with visual impairments. Walking along the High Street is a nightmare and it’s supposed to be a pleasant place to be. My concentration is focused on touch and sound. The noise of the traffic is often deafening and feels really, really close. We’re walking at lunchtime so traffic is relatively quiet, the noise must be unbearable at rush hour. We pass Trinity Square and then David points out that I’m currently standing in the middle of the Ivy Road junction. It’s a raised pavement which is great, except there’s no tactile paving before the junction to warn me. My elbow is grabbed and I’m safely across Ivy Road. By now I’m beginning to get a headache just from the intense concentration on the simplest of tasks, walking along a shopping street. Everywhere I go is a challenge and really feels dangerous, it is little wonder that lots of people with visual impairments end up house bound. Hazel explains that she does a considerable amount of voluntary work helping people who are losing their sight to gain in confidence to leave their homes and try and maintain an independent life. 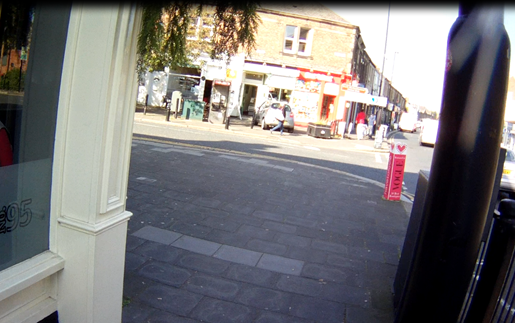 I can’t see people waiting at the bus stop in front of me and how narrow the pavement is again. The video footage shows everyone kindly moving out of my way as I sweep my cane and tap their feet. Yet more narrow gaps and a lack of space. The constantly narrowing pavement continues. 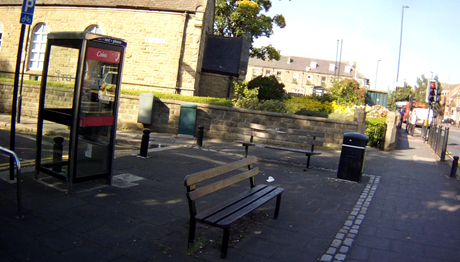 We reach the end of Woodbine Road and David explains to me the ‘cordoned’ area denoted by cobble stones so that I can feel under my feet when I move into this area and find the phone box and bench. We get to the crossing at the Queen Vic. I am super cautious as I’ve had near misses from a number of red light jumpers at this junction. While we wait for the green man signal to cross David explains the difficulties that the fence along the pavements can present. If someone with visual impairments goes ‘off line’ when crossing the road they can find themselves stuck on the road at a barrier not knowing whether to go left or right or indeed how the long the fence is. David marches me across the road, explaining that pedestrian refuge in the middle of the four lanes is no real refuge for me since I don’t know it’s there! Finally, I’m on the home stretch and I’ve been edging my way along our High Street for a good 45 minutes now. H ey presto, let’s put a lamppost bang smack in the middle of the pavement. That’s helpful! My confidence hasn’t increased much, and I’m concerned that I’m consuming lots of David and Hazel’s time so I increase my speed from snail to sloth. before I walk into another A board! Finally we’re back at Costa and I can take off my blindfold. I am drained, exhausted and shattered but pleased that I’ve undergone the experience. Hazel and David just laugh, they’re so used to all these problems. There is so much that is wrong with our High Street. It seems that the last people we have considered are those with visual impairments. It’s worrying considering the number of older residents in Gosforth and the huge impact our poor pavement quality and pedestrian space will be having on their everyday lives. Newcastle City Council is about to release plans for a series of major changes to our High Street. I will be writing to the Officers urging them to go on a blindfold walk. If we can design our streets to meet the needs of the visually impaired it’ll be a much safer and more pleasant place for everyone. This should be the absolute baseline for any changes undertaken. If you see me about feel free to stop me and ask me any questions. Finally, a massive thank you to Hazel and David for their incredible patience, good humour and expertise at keeping me safe. 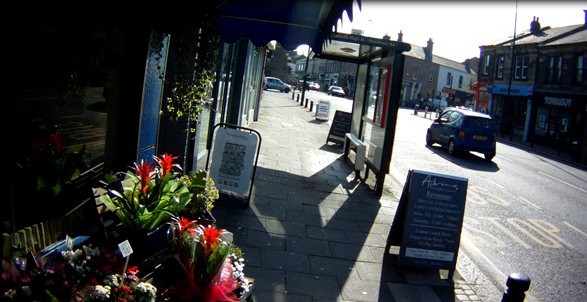 This entry was posted in Accessibility, Gosforth High Street, Safety and tagged blind walk, Gosforth, Gosforth High Street, Guide Dogs, pavements, RNIB on January 8, 2016 by SPACE for Gosforth. 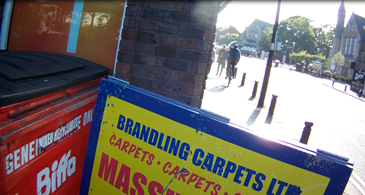 “The use of tactile paving is currently being reviewed nationally by the government to create a new set of standards”. Do you have more info in this? Would it be UK-wide? Or by ‘national’ do you mean England? Nice post btw. Great to see cycling and walking issues connected/campaigners working together. I believe that there are a number of devolved powers to Wales, Scotland and NI for transport so this consultation would apply to England, but not confident on that point! There’s also a shift in to give local authorities greater devolved powers too. But I haven’t researched the details of these. Worth reminding a few folk that traffic has feet as well as wheels and obstructing traffic carries a penalty through Section 137 Highways Act 1980 – with a maximum fine of UKP1000. That obstruction us your A boards, and motor vehicles, and a purge on the footways leading down to Jesmond Dene often blocked full width by someone’s parked car would make a few folk think twice before putting wheels on a footway. There is one additional action, when the vehicles are over 7.5 Tons – the sort that breaks up the pavement on the footway. There is no need to catch those drivers in the act Section 19 Road Traffic Act should land them with a fine or court appearance. Take that walk again only this time try totting up the total in fines which might be recovered for obstruction, driving on a footway, and parking an HGV there. Unfortunately most parking attendants can only issue parking fines. Perhaps there is a case for including the ability to issue tickets for obstruction and driving on footways? Thank you for such a good description of the hazards on the High Street. You describe exactly what my husband deals with on a daily basis, however his journey is made easier as he has a guide dog. Thanks again and thanks for raising with council. Pleasure Caroline. The reality is that if we can fix the High Street for the visually impaired everyone by default benefits! That’s why I believe it’s the starting point. 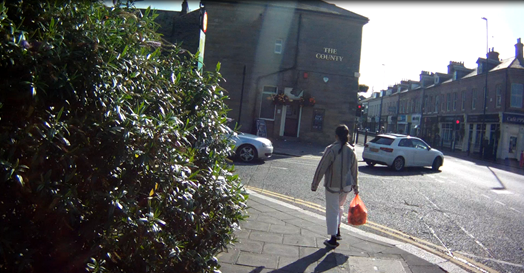 For sighted people as well as those who have a visual impairment, an ever more frequent hazard comes from cyclists (adults – not children) who choose to cycle between pedestrians on the pavements along the High Street. They don’t use bells, so with traffic noise in the background it’s not always possible to know that they are there. I thought that this was illegal, but have yet to see anyone being challenged. An active elderly lady in Gosforth was hit by such a cyclist several years ago, broke her hip, and never left her house after that incident. There are generally three groups of people who cycle on the pavement; children, people scared of the roads, and the inconsiderate. There’s not a lot anyone can do about the latter. But for the first two, all we need to implement is safe separated infrastructure to make cycling from A to B a pleasant safe experience for people. Hopefully the inconsiderate would follow too! A boards on the High Street have always irritated me as they impede pedestrians, walking as a couple, blind people, walking with a pushchair, or wheelchairs. We are all wary of stepping out of gates on Halls Estate GNRoad as cyclists whizz bell- less up and down the pavement- but who wants to use those new cycle lanes? The slippy, dog muck deposits and the months old slime left behind from autumn leaves outside Salters Road car park are also hazards….. A good blog. Thank you. 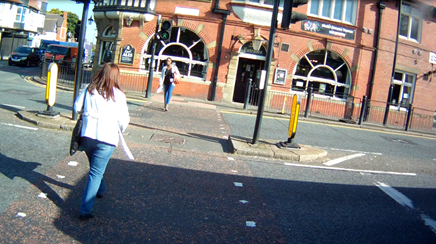 Everyone I know who cycles uses the cycle lanes on GNR. But sadly in all forms of transport you get the inconsiderate few. Fortunately a minority but stay safe. Nice blog, Peter. Welcome to my world! 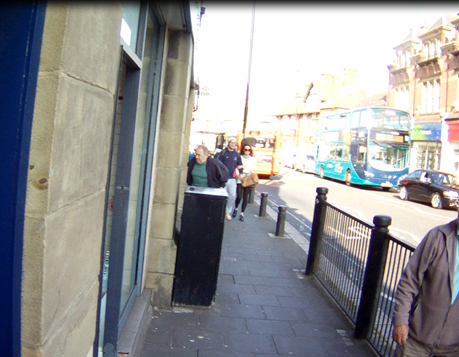 I’a blind resident of Gosforth and the High Street is a real challenge and it seems to be getting worse – a combination of poort planning/design and inconsiderate drivers and cyclists. I don’t think it’s just me getting older and grumpier. I’ve already challenged Sainsburys and Greggs about their A-boards. Thedaft thing is there is no evidence that these things make any difference to our shopping habits – and yet they seem to be everywhere. As Peter hints at, I think… clearly defined spaces are important, I daresay the solution. Question for the high street therefore must be: how much space do we want to relent to car driving and parking? A grating question with some – yet if we do not address the elephant in the room (eh, in the high street), it risks to remain as it is: hostile to walk and very uncomfortable to cycle. 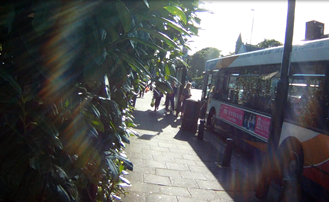 Let’s agree to keep it as a bus route – and perhaps with separated cycling, and separated walking facilities along it. Thanks Katja, yes it all boils down to space and how much space we want to allocate. My personal preference is people. I’d like to see the pavements doubled in width along the High St and a separate cycle lane run running alongside where possible. I’ve noticed a few comments on other social media sites complaining about the rise in electric mobility scooters and the “menace” they cause on pavements. Where best to for on older person or someone with disabilities to scoot around on? That’ll be a safe cycle lane! Newcycling’s position statement sums up the issues and resolution to pavemnet cycling perfectly. Thanks. Excellent article. Hope it has been posted to the City Engineers/Planners. As an able bodied pedestrian I find the High Street a challenge what with A boards ( The Queen Vic being the worst offender), bus shelters, lamp posts, slippy tactile paving, cyclists and so on. Yes it’s been forwarded to the Heads of Transport/Roads/Pavements at NCC for comment. Hazel and I will be writing a follow-up article shortly on what we’d like changing and we’ll include the response from NCC.